Kirkman(R) Announces Winner of the 'Memories With Father' Contest! 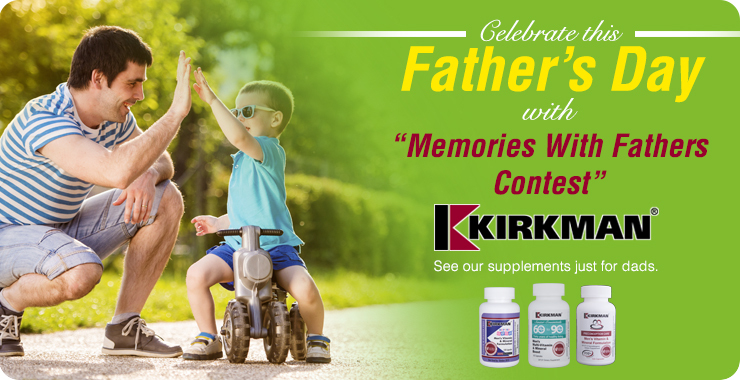 Kirkman® Announces Winner of the 'Memories With Father' Contest! RENO, NV--(Marketwired - June 22, 2015) - Kirkman® has named a winner of its 'Memories With Father' contest; an event that celebrated this past Father's Day with readers' favorite memories of their dads. Entrants were invited to write and send in stories involving their favorite memories with their father, whether it was a comedic anecdote, a heartwarming circumstance or even a favorite characteristic that made a lasting impression. In the end, the story that came in first was a lighthearted tale of nervousness and trust that is at once unique, but also a common situation to which many can relate. The winner is Kelly Duffy of Hamilton, Ontario who tells a harrowing yet comedic story: "My favourite memory with my father was the time when he and I drove to Newfoundland Canada. I was about 17, just got my drivers learners permit. My dad hated to drive through Quebec, Montreal to be specific. So he pulls over all of a sudden, says to me "you're driving" gives me vague directions to stay on the highway, and proceeds to FALL ASLEEP LOL! I vividly recall the terror I felt on that drive. Dad passed out beside me, and me inches away from tractor trailers and other cars on a busy Montreal highway!" Kirkman® is pleased to award Kelly a $100 gift certificate to spend any way she likes on her favorite products at Kirkman's website. Kirkman® is the leading manufacturer of nutritional supplements for individuals with special sensitivities and dietary requirements. Founded in 1949, Kirkman® is also the oldest nutritional supplement company serving the special needs community. This experience has allowed Kirkman® to pioneer effective products in many areas of nutritional supplementation for individuals with special health needs. Kirkman® distinguishes itself from other nutraceutical companies with its Ultra Tested® protocol for purity testing, which calls for testing every raw ingredient in every product it manufactures for more than 950 environmental contaminants. Kirkman® celebrated Father's Day with its "Memories With Father" contest.